Because everyone is different, psychologists have long debated how to characterise personality. Persistence leads to the maintenance of a behaviour despite fatigue, repetitiveness and frustration, and often results in such qualities as industriousness and determination. 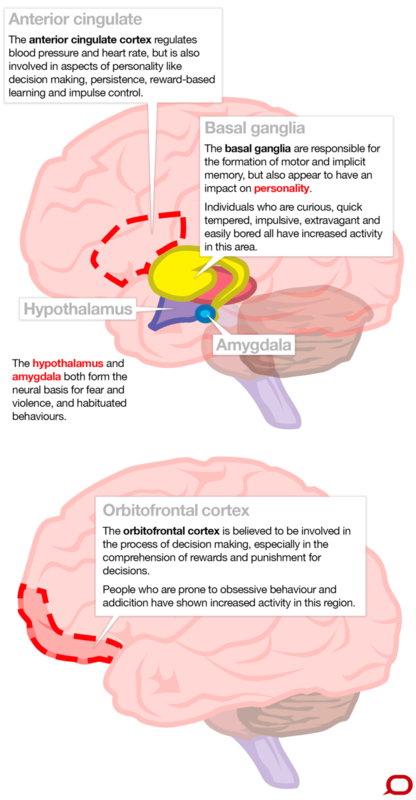 The regions of the brain particularly important for this include the inner and lower parts of the frontal lobes, especially those called the anterior cingulate and the orbitofrontal cortex, and their networks that involve the basal ganglia. Persistence is loosely related to motivation. Emotion plays a major role in maintaining this drive, as basic emotions, such as happiness, tend to energise behaviour and lack of emotion has the opposite effect. There is also considerable redundancy in these networks, as they have an innate ability to compensate, sometimes referred to as neuroplasticity. An excellent example of neuroplasticity was demonstrated in London taxi drivers who were shown to have increased grey matter in the back part of their hippocampi – related to spatial representation of the environment - when compared to those who weren’t professional drivers.